The "Aged to Perfection" party theme is perfect for birthday or retirement parties. The party plan comes complete with invitations, music, menu, venue, party games, and gift ideas. Invitations for this this theme would ideally have some reference to wine and aging, like the invitation shown above. Browse this collection of invitations that are suitable for this theme for a greater selection. The venue for this party can be at a home or your favorite pub or wine cellar. Classical orchestra music is a winning choice for this party. The food would be wine and cheese, as BOTH are at their best when "Aged". Fruit, vegetable trays, and nuts are a nice accompaniment. 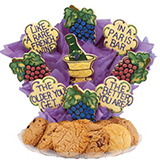 Like a rare French wine, this cookie bouquet is sure to shine at this party theme. Use it as a decoration that turns into party favors. All you have to do, is just type "Aged to Perfection", in the search box located at the top of the page locate and order these custom cookies that "tastes as good as they look!" This is your classic Bingo game pre-filled with Birthday items. With our Game Card Generator, you get a different Birthday Bingo Card for each player- even if you have 200 players! Call card included. Keep the entire group entertained for hours! Play in teams or individually in this fun game of Charades or Pictionary with over 100 different cards. Have guests fill in this questionnaire about the party star and find out who really knows them the best! Inventors never retire, they just reinvent themselves! A witty addition to any party that will surely guarantee 100% participation and belly laughs! Guests race to fill in statements about why different professionals will never retire. Treat your guests to the perfect break from toasts or speeches by adding in a little competition, not to mention laughs! Players use a list of words to complete famous slogans about retirement. For example, "Retired not ______!" One door is closing and another is opening... from gold watches to Mojitos, visiting The Louvre or kayaking the rapids, and of course wrinkles and rocking chairs! Treat the retiree to a rousing game of Retirement Taboo that covers everything they have to look forward to. 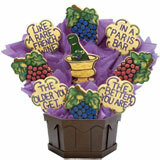 What could be a better gift idea for this party theme than fine wine?